It’s Friday already? Alrighty then, time for another free crochet pattern as part of JJCrochet’s Free Pattern Friday. I woke up this morning and was brainstorming what I could make and offer as a free crochet pattern for FPF. I wanted something quick for summer, something useful, something practical. 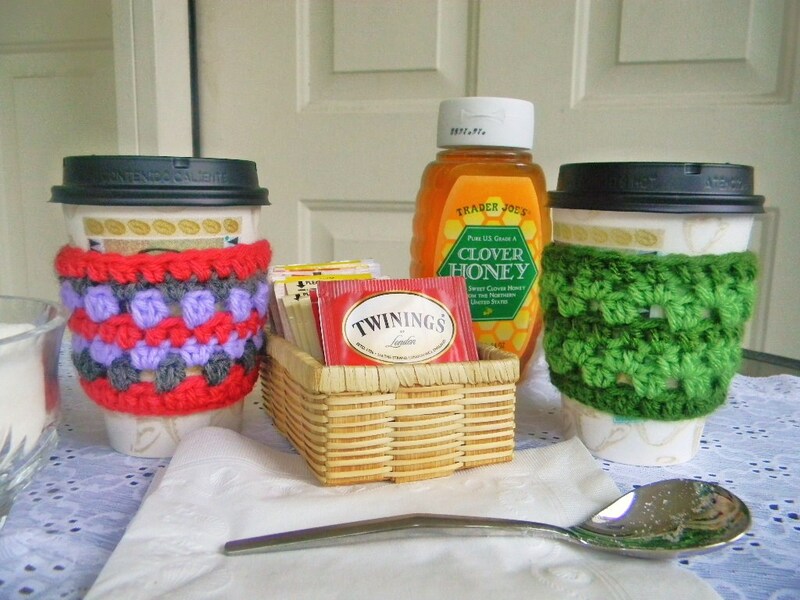 Something people could make that would work crochet into their everyday routines. 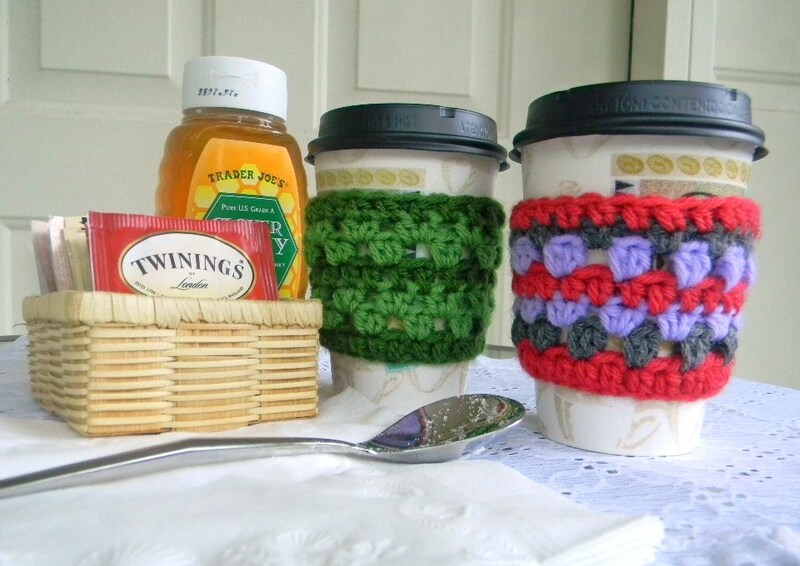 A couple months ago one of my good friends, C.J., suggested I made crochet coffee cozies. I instantly loved the idea, but hadn’t gotten around to crocheting up a prototype until today. So thank you, C.J. for your inspiration! Small amount Worsted Weight Yarn. I used Vanna’s Choice Solids. With smaller hook (size E), Chain 25. Join with sl st to first chain. Round 1: Using larger hook, Ch 2 (counts as first hdc now and throughout), hdc in each st around (25 st). Join to first hdc with sl st. Round 2: Ch 2. *Ch 1, skip 1 st, 2 hdc in next st* Repeat around until beginning. Ch 1, 1 hdc in same last st. Join to first hdc with sl st. Round 4: Ch 2, hdc in each st across (25 st). Round 7: Using smaller hook, Ch 2, hdc in each st across (25 st). 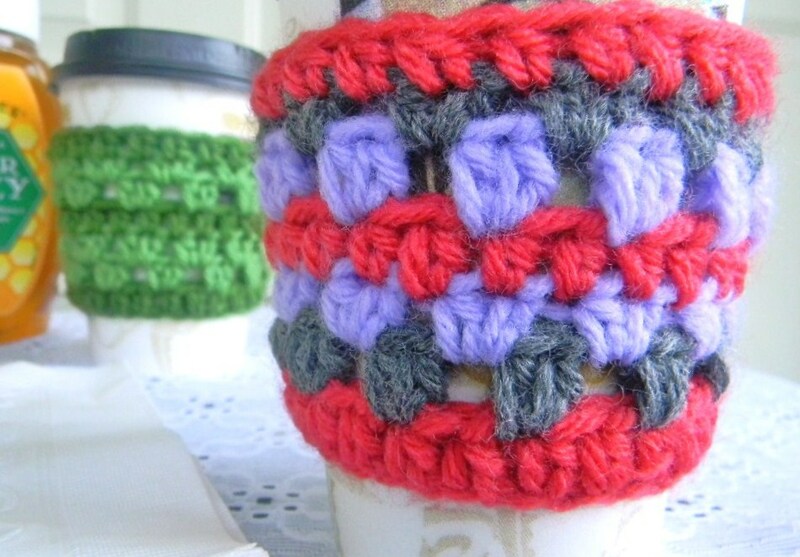 Experiment with your own colors to create your very own crochet coffee cozies to match your style. They’re reusable, easy to wash, and a greener alternative to paper covers. Happy crocheting! Do I switch to the larger crochet hook on round 1? Ah – my mistake. Yes, you switch to the larger hook after Round 1. 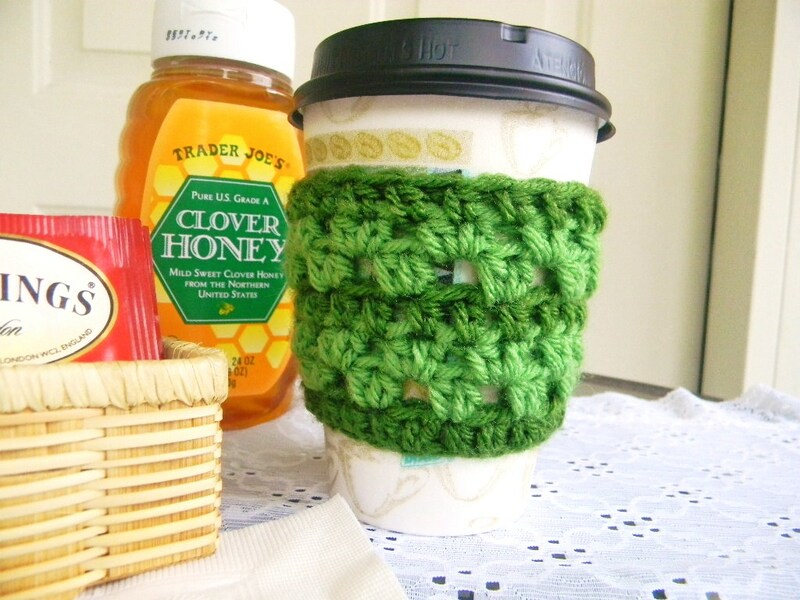 This gives the crochet coffee cozy a tighter fit. You also use the smaller hook again for the final round as well. I’ve updated the pattern to correct the omission – thanks for catching that! Had a question bout this step. It says ch 2 *ch1…..wouldn’t that just be ch 3…what am I missing hear? I love this pattern. You’re absolutely right! You do chain 3 in Round 2. I’ve written it as ch 2 + ch 1 to separate the initial ch 2 at the beginning from the repeated *ch 1, sk 1 st, 2 hdc*. You’re correct that you do chain 3 – that’s just my reasoning behind it. Hope it helps – good luck! Great pattern, thank you! just wondering what is your policy for gifting/selling finished items made from your pattern? thank you! Im still new at reading patterns….would love a video! I am doing something wrong and I do not know what it is. I wind up having way more than 25 stitches by row 7. As I crochet it is not going down . Confused. Can anyone help? I am 90% sure I am doing hdc correct. It is yarn over, through the stitch , yarn over and pull through (3 on needle) then yarn over and pull through all three. Is this correct? Hi Amber – feel free to e-mail me with any problem you’re having with the pattern (http://jjcrochet.com/about/contact/) and I’d be glad to help you out! Hi, thank you so much for this great pattern! I have a question…maybe this is a dumb question, but after the initial 25 chains, are we supposed to HDC back across the chains? I keep getting stuck when I HDC back across the initial 25 chains and then try to slip stitch into the first hdc. Does that make sense? I keep thinking maybe I should join the 25 chains with a slip stitch & then hdc around. After you make the initial 25 chains, you join them with a slip stitch so you have a ring. That should make it easier to sl st to the top of the first HDC, ha – Not a stupid question at all. Have fun! Glad you’re using the pattern, Linda – enjoy! On round 6 (repeat round 3) I ended up with less than 25 stitches. It made the cozy tight and then on the final round I didn’t have 25 stitches to do. I ended up just doing hdc in each st on round 6 and it worked, but I wondered what I might be doing wrong? Thanks for your help. I love this idea and wanted to make several for Christmas gifts! 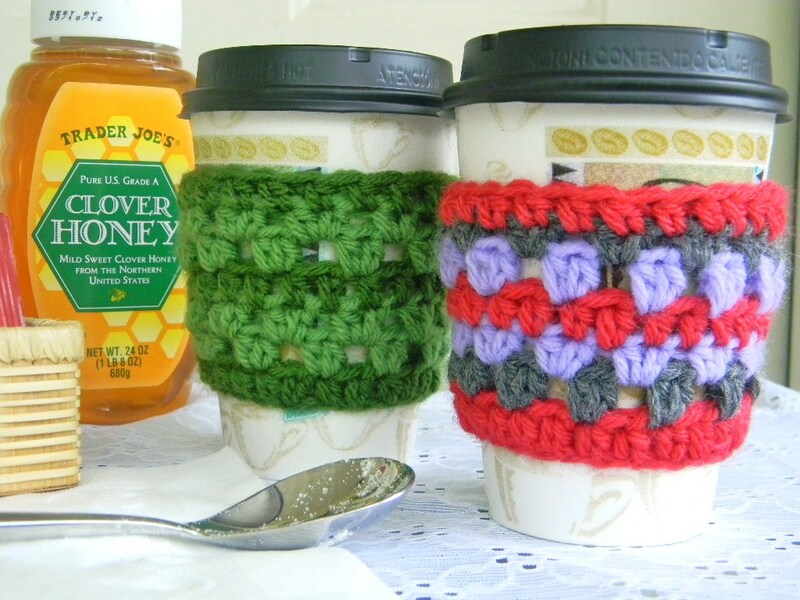 I made this pattern a couple times but they are not wide enough to fit over the cups…they are too tight. Should I move up hook sizes or should I add a few more chains/stitches? Thank you for sharing your pattern. I have some already to give as gifts, and going to try on sell. Once again Thank you for the allowance of selling the finished products. Giving you much credit for this.